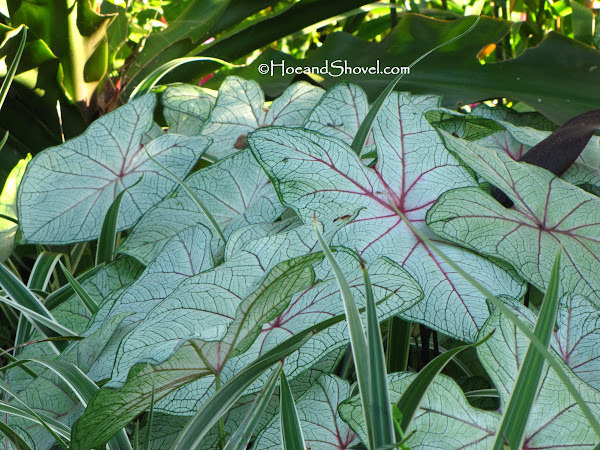 In my continuing aim to profile each variety of caladium growing in my garden it is probably necessary to distinguish two of the types that strongly resemble each other at first glance. 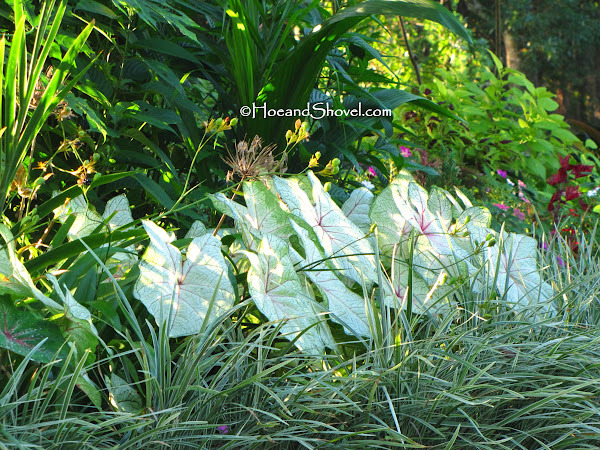 Recently the attributes of 'White Queen' were enthusiastically hailed as an all-time favorite for use in my garden. As of this moment that fact remains true. However, it is only fair to give equal claim to 'Florida Fantasy' ~~ the variety with an almost identical face; yet it maintains one distinct difference. At least in my altogether unscientific observances. The height and habit of each is relatively the same but one less noticeable difference is the background white on 'Florida Fantasy' is less creamy. Maybe a better way to say it is the 'Florida Fantasy' has a true white background separated by tiny green veins and bright green edging along all of its heart-shaped glory. They both do well in partially sunny situations. Honestly, I've not tried 'Florida Fantasy' in a sunnier situation than the angle of brightly glowing late-afternoon sun in which it performs well. In my experience 'White Queen' holds up quite well in a brief amount (2-3 hours) of Florida's brutal mid-afternoon rays. 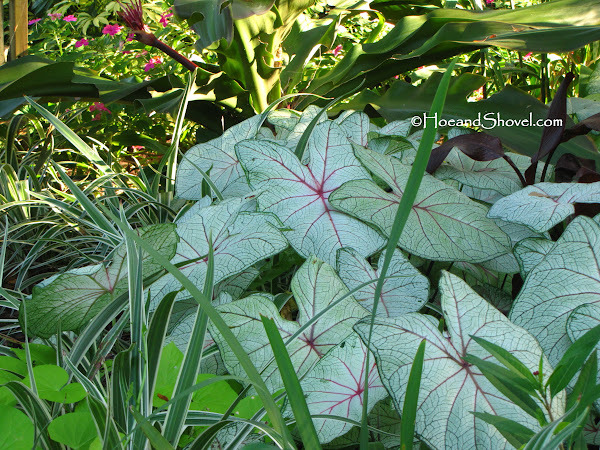 For many years now I've planted clumps and sweeps of 'Florida Fantasy' along the outskirts of the tropical pathway. I fully appreciate how their cheeriness stands out among the neighboring foliage lasting for the entire summer. They are tucked below the retaining wall among irises, flax lily edging, fading canna, a rambling sweet potato vine and at the feet of one of the giant 'Queen Emma' crinum lilies. The most noticeable difference of 'Florida Fantasy' that distinguishes it from the similiar 'White Queen' variety is the deep magenta central vein never bleeds out into the white face. 'White Queen' can be affected by soil and bulb size and fertilizers in which the central vein bleeds out into the white changing the coloration resulting in an almost completely red or pink face as shown above. 'Florida Fantasy' is always true white! I prefer true white. This one quality makes her superior to 'White Queen' in my opinion. For some reason 'Florida Fantasy' is much harder to come by... which translated means it is not as hardy of a crop for the growers. Fortunately I found mine at Classic Caladiums this year. 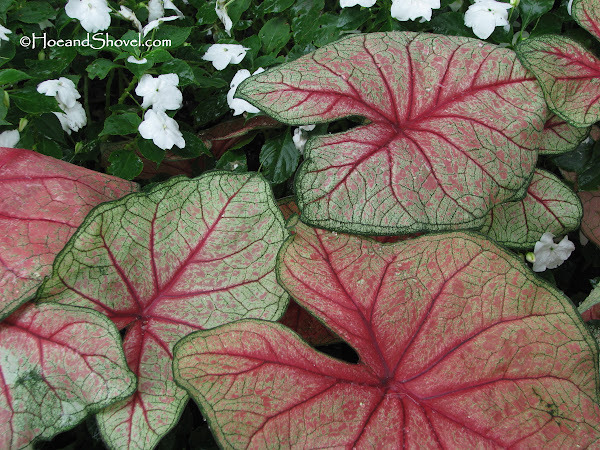 No matter which caladium you feature, I love them all. Mine are still going strong and have been such a joy to grow and see. Didn't know that the White Queen would turn colors like that. Good to know about Florida Fantasy staying white. I've gone crazy with the pinks and reds this year and I think it's time to put in more whites this coming spring. I think I'm smitten by every single variety once they are sprouting in my garden, FlowerLady! How very exciting! I don't have any salmon colored ones although I have seen some in the production fields. I hope it does well for you. Not too many pinks here I seem to stick with the reds, whites and of course chartreuse with Miss Muffett. I really have enjoyed all your combinations this summer! 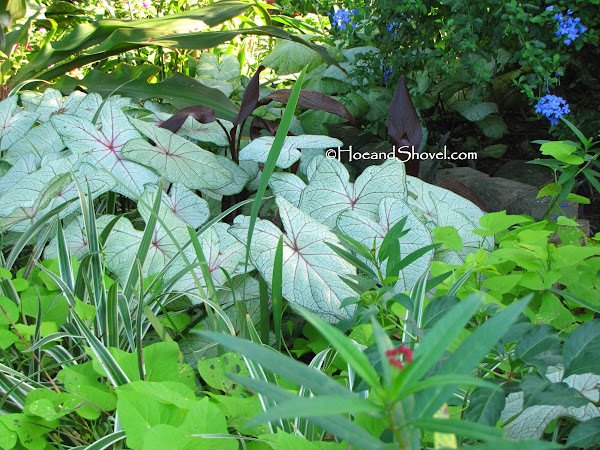 Classic Caladiums carries every variety I've mentioned this year. They will take orders for next year starting in November but won't charge your credit card until the bulbs are shipped. It's a good way to get a good selection of the variety you prefer. You've chosen some really good varieties to get started with. 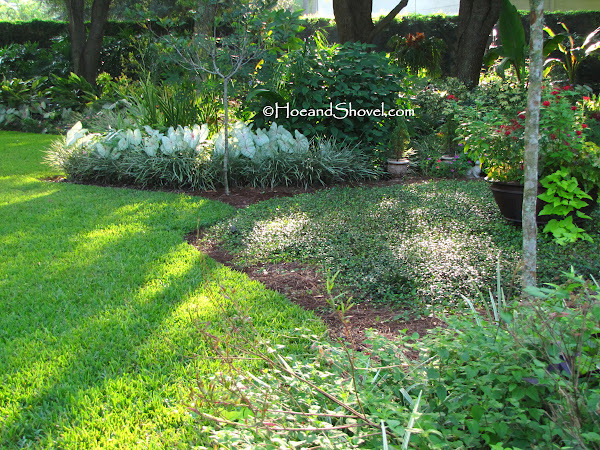 Typically I like to plant one variety in large numbers with another single variety across from it to complement or behind/beside it (depending on the landscape view). But you are correct. 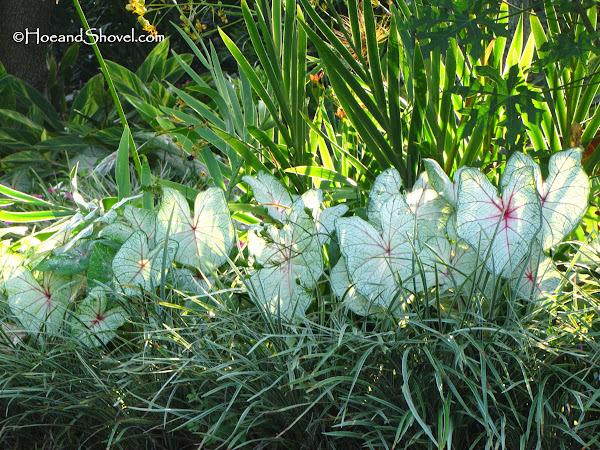 Once in a while I will plant a clump of whites with a clump of reds next to it. 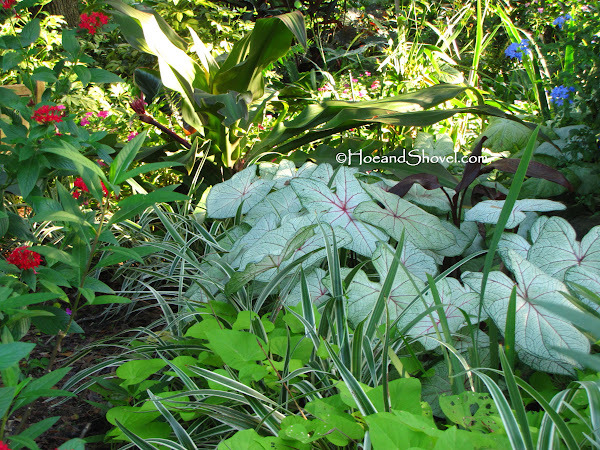 I don't prefer mixing them all up together ~~~though I've seen it done ~~and since I'm a fan of caladiums..... however it works for each individual is fine with me.